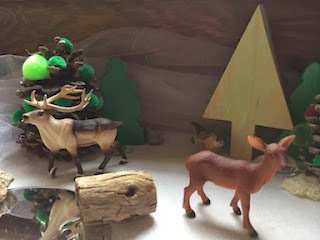 I'm not sure whether the solstice nature table counts as an advent surprise or not. I guess it depends on how flush you are with ideas. Last year, I decided it counted. This year, I have a few additions to the table. First, Starboy's wonderful wooden Christmas tree, that he made with Techman a month ago and I haven't taken the chance to post about yet. I LOVE this tree. He "decorated" it by coloring the whole thing with sidewalk chalk. And I LOVE that he and Techman made it together. Next, the frozen pond. 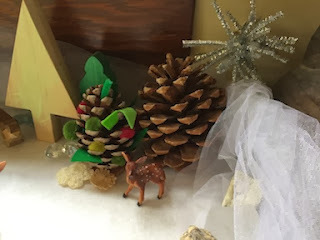 It reminds me of my grandmother's snow scene that she used to put out on her dining room table, when I was small. It was a skating scene and she would spread the whole village out on the mirror from her vanity. 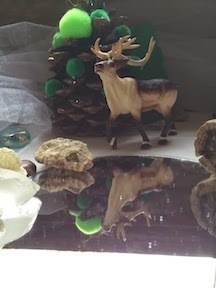 Then, some netting to pose as snow, a new piece of snow/felt (that I once again cut too small and it doesn't cover the whole table, sigh), and a new pinecone christmas tree decorated with glitter and pom-pons. And of course, the pipecleaner snowflakes. 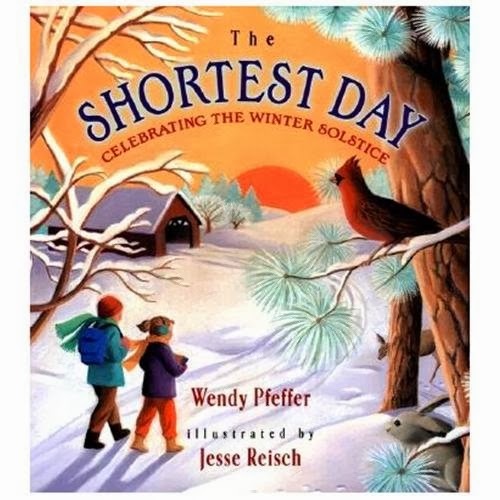 Today's book was excerpts from The Shortest Day, by Wendy Pfeffer. If you choose the pages carefully it still sort of sounds like a story. The book is a bit wordy to read in-depth to a preschooler, but it will be handy in a few years when he's able to better understand the concepts.